A child of 2 or 3 years will torment his or her parents with a continual series of “whys,” the pope said. The little ones are not looking for answers as much as they are seeking the attention of mom or dad. “We can ask the Lord, ‘Why, Lord? Why do children suffer? Why this child?’ The Lord will not respond with words, but we will feel his gaze upon us and this will give us strength,” Pope Francis told the parents of 20 seriously ill children. The pope met the children and their parents the evening of May 29 in the chapel of the Domus Sanctae Marthae; the group participated in a Catholic-sponsored pilgrimage to the Marian shrines at Loreto and Lourdes. One of the fathers, Andrea Maria, told the pope about his wife’s difficult pregnancy and how doctors had recommended an abortion. They refused, he said, because he and his wife felt God was calling them to an even greater love. Pope Francis told the parents that just as the real presence of Jesus in the Eucharist is a mystery, so, too, is the suffering of children. Mary, he said, must have felt confused and even betrayed. 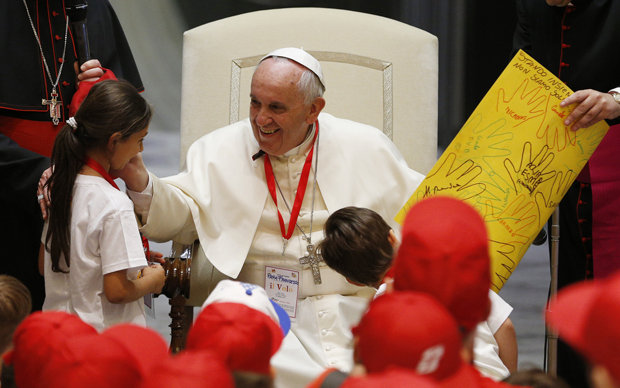 Pope Francis was back with another group of children the next morning. The Italian youngsters, some of whom were born in prison and all of whom have at least one parent in jail, were treated to a special train trip thanks to the Pontifical Council for Culture. Flying and dreaming were the themes of their activities and their fast-paced conversation with the pope. 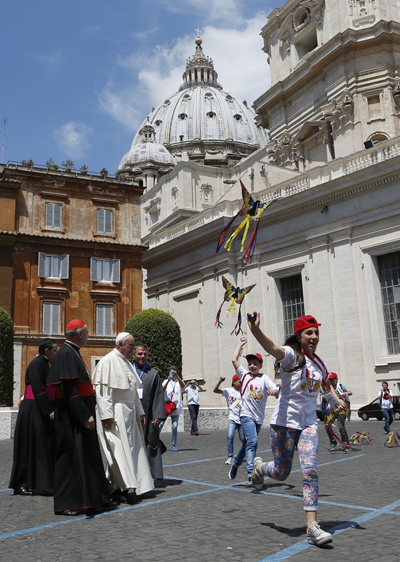 They began their meeting with him by flying kites in the cleared parking lot next to the Vatican audience hall. Some of the little ones got up before dawn to board in the train in Bari, a town in southern Italy. Encouraging all the kids to gather close around him, he invited the exhausted ones to take a little nap on the rug where his chair was. Pope Francis asked the children if they could describe a child who is unable to dream. They said such a person would be unhappy and would have a heart of stone.